First off: it’s the end of July 2013, and the Boston Red Sox are in first place. But barely. Tonight’s game has David Price pitching for the Tampa Bay Rays; he owns just about every American League team, no more so than the Sox. In the 5th inning, he’d only thrown about 55 pitches; a mere 11-an-inning average. Given Price’s stuff, the Sox have to get him out of the game. But with that low of a pitch count, Price might conceivably pitch into the 9th inning. You know The Professor has been rooting for the Sox since he was a kid, since his long-ago Transistor Radio Summers of Connecticut Yore. Picture him [then known incidentally as The Computer] in a large, largely empty, Egyptian Cotton tent [the kind you can stand up in, made by LL Beans] raptly listening to the games on WTIC 1080AM, thanks to a D-battery-powered AM/FM radio. He’d be laying atop a rectangular sleeping bag on top of a folding canvas cot, box-scoring by the light of a kerosene lantern. Back in Fenway Park and with the Rays holding the lead, Price finally leaves the game in the 8th inning. And to cut to the chase, the Sox finally get a rally going once Price leaves. There was a little spark, a chance. On what looked like a deep-enough sac-fly to score, Daniel Nava tagged-up at 3B and sprinted for home. But he was called out when the umpire decided that the ball beat him to the plate. Nava’s delay getting plate-ward gave the ump the chance to snafu what was undoubtedly a close call, and he obliged. As Nava leapt to celebrate his feat of sliding under-and-around the tag, the irony of the situation hit The Professor. Nava thought he was so safe that he started celebrating, even as the “out” call rang from behind the ump’s mask, through the wide-open mouths of the play-by-play announcers, and simultaneously from fan to fan through the stands. Replays on NESN showed pretty conclusively that Nava beat the catcher’s tag. In the end it doesn’t matter. 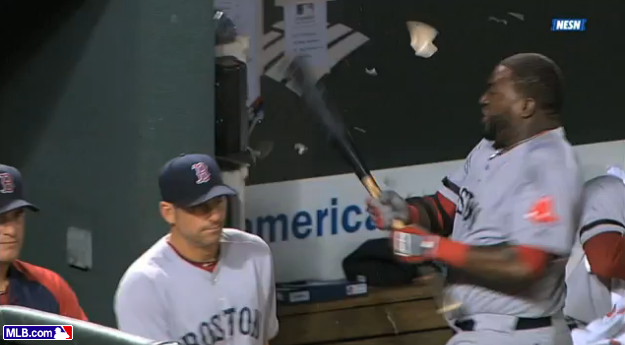 Nava argues vehemently and is summarily ejected. The Sox ultimately go on to score one late-game-run but it’s not enough. Overall, they flame-out offensively en route to a 2-1 heart-breaking, nut-buster of a game. A game that was theirs for the taking. Classic RedSox, fans might say, inventing ways to lose. But The Professor, with thanks to his brother, always thinks back to that point near the end of the 2004 season when the Boston Red Sox, down three games to none, came back in the play-offs to win four straight games against the New York Yankees and from there, went on to win their first World Series in 86 years. That’s the truth of the Sox, winning when they have no business doing so. With their win tonight, however, the Rays took over first place from the Sox by 1/2 a game, and that’s why it’s sometimes scary being a Sox fan. Even when they are in first place, on any given night the fans don’t know if they’re getting the team that invents new ways to lose or if they’re getting the team that finds improbable ways to win—and that’s why they call me The Professor.